But it does bring me to the fun fact of gameplay elements in games that aren’t particularly logical if you think about them just a second longer. Like the fact that super smart world saving scientists cannot ‘share knowledge’ with each other in Pandemic. What happened to phones and e-mail? 😉 Or that newborn kids in Agricola can work after one turn? Logical gameplay mechanics, of course, but slightly funny if you imagine it in the real world. Can you name any gameplay mechanics that would be ‘weird’ in real life? I always found it amusing you could save the world by shopping in the giftshop. 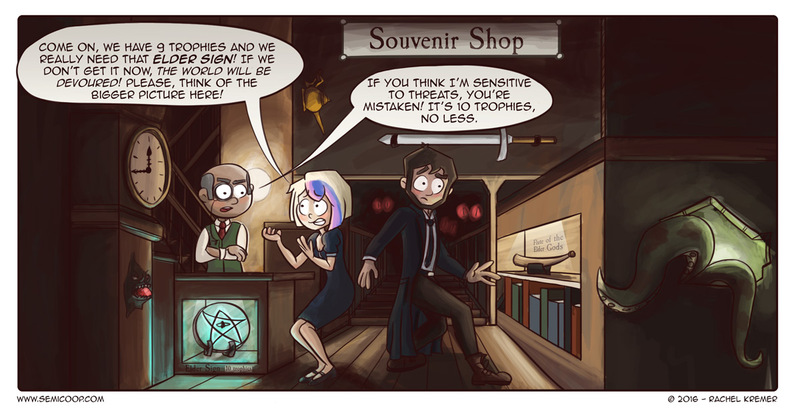 With the unseen forces expansion for elder sign they did remove the ability to buy elder signs with trophies though so it really changes things up and you can spend them on other stuff instead of always stockpiling them for elder signs. Food Chain Magnate: You may only advertise a type of product (Burgers!) not the name of your store, customers will get a hankering for the item and find the one that’s lowest price + closest. Billboards only work if directly adjacent to a house, and only affect that house. If a customer wants multiple items, and you can only provide some, they’ll stay home. You do not pay workers unless you train them. Once trained, everyone from Burger Chef to Executive Vice President to Zepplin Pilot make the same pay. All employees are salaried, you pay them whether or not they work. The first person to advertise never pays for marketing again and their ads run for eternity. The first person to waste food gets a fridge that no one else gets. I, for one, would not wish to walk down a road paved in sheep.